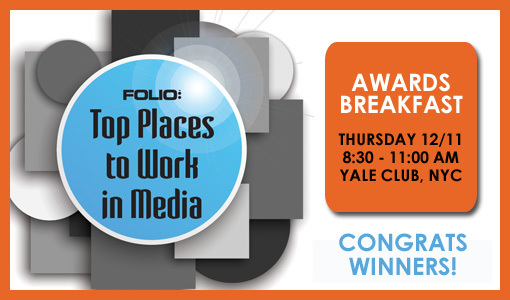 Folio’s Top Places To Work in Media Awards shines a spotlight on organizations that benchmark outstanding places to work among consumer and b2b media companies and their partners. The winners of the innaugural program will be saluted at Folio’s Eddie & Ozzie Awards Breakfast on Thursday, December 11, 2014 from 8:30 – 11:00 a.m. at the Yale Club in New York City. We hope you’ll join us to celebrate these desirable places to work their inspiration teams to work with. The Folio: Eddie & Ozzie Awards Breakfast is sold out! *Reserved Tables of 7 and 10 are available and come with priority seating. For questions regarding the Awards Breakfast, please contact Danielle Sikes at dsikes@accessintel.com, 203-899-8433. For information about sponsoring the Folio: Top Places To Work in Media or purchasing a congratulatory ad in the special awards program, contact Tania Babiuk at tbabiuk@accessintel.com, 203-899-8498. Don’t miss your opportunity to celebrate your company’s success and network with the top minds in magazine media. Register your team today! association, and city and regional.